We've all heard that classic story about the star-crossed lovers. You know, the one where that guy falls in love with the girl and they must overcome impossible odds in order to be together. Warm Bodies is exactly that story, only with a twist; cause, well, he happens to be a zombie and she's still human. R (Nicholas Hoult) isn't your average zombie. Sure, he'll eat your brains and all, but at least he feels bad about it. Julie (Teresa Palmer) kills zombies and when her boyfriend is eaten by one, she's forced to put her life into his hands. Lucky for her, it's R. After saving her life, R and Julie form a special bond as she struggles to survive and he learns what it is to be human again. Slowly, they fall in love and manage to exhume hope for all humanity --- both alive and dead. Since first seeing the trailer for Warm Bodies, I knew it was a movie I had to watch. The fact that it's based off a popular book of the same name is just a sweet bonus. 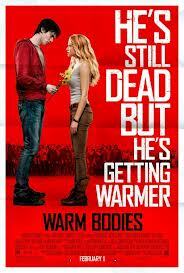 Warm Bodies is sort of a cross between Romeo & Juliet and Zombieland. Not quite a comedy and not quite a romance, it's a story that's about the power of human connections in a dead, desolate world. Levine has demonstrated an uncanny ability to bring poignancy and warmth to the most unlikely genre fusing zombies, humour and intelligence in to one satiating 97 minute showing. And though it is a zombie film, it's important to note that few of the a-typical zombie tropes stand. But fear not, because the deviations work and help to make the movie a big success. The best thing about Warm Bodies, though, is the cast. Hoult charms as the undead, love sick R and Palmer is radiant as the curiously bold Julie. Together they have a flirtatious chemistry that makes you believe the impossibility of their precarious relationship. Palmer reminds me of a young Natalie Portman both in looks and in spirit. She exudes that naive innocence and hopefulness that is so characteristic of Shakespeare's Juliet, while updating the performance with a bad-assery and curiosity that keeps you rooting for her. Hoult, on the other hand, is uber talented. I have a feeling he'll end up one of those underrated actors, much like Jesse Eisenberg --- so much potential and not enough credit but perhaps this movie will change all that. It's Hoult's charisma and the subtle nuances of his physical performance that make him the one to watch. He's engaging and funny and compassionate, everything you want in a modern-day Romeo. Warm Bodies also has a strong supporting cast, consisting of the funny Rob Corddry, Analeigh Tipton of Top Model fame and the notorious John Malkovich. They each hold their own and do a decent job but it's clear why they're the supporting cast. They along with the Bonies sub-plot serve solely to move the storyline forward. Here Hoult is the star, carrying the picture from start to finish. It's hard to be original in the zombie genre, but Levine with help from Marion's witty screenplay, manages to keep it fresh, despite the masses of undead. The comedy is more of the observational kind, delivered mostly through R's inner monologue. Also, the use of music in the movie is incredibly ironic and perfectly timed, earning many a laugh from myself and the rest of the audience. All in all, I can sufficiently say that I adored this movie. There's no doubt about it, Warm Bodies is a zombie flick with brains and heart. Warm Bodies is a quirky and unconventional zombie flick that will bring a beat to even the deadest of hearts. Rich with potential, this movie takes a tragic classic and turns it into a warm and hopeful rom-com, sans the traditional sap. Warm Bodies is funny, earnest and sweet with all the addictiveness of Twilight, only it's so much more well-executed. If the on-screen version is this good, I can't wait to see what the novelisation has in store for me next! You can watch the first four minutes here. I'm so excited to see this movie! I tried to go this weekend, but I got too busy. I'm glad you loved it, I'll try extra hard now to fit it in:) Thanks for the review! If you're going to spend the money to see a movie in the theatre, I recommend this one. I've just started the book and I adore both versions! I completely understand, Wendy! I've just started reading the book and have noticed a few differences, but regardless, I adore both versions! I've noticed there are some key differences between the book and film and the overall tone is a bit darker (in the book) so far, but overall, I like the changes they made. It works for the better, I think. I actually really loved Warm Bodies! It had moments of ridiculousness but it was good fun. The book or the movie (or both?). While there are some moments that deviate from the standard zombie tropes, I do think it works in the context that it's been used. I feel like they made the movie a bit more YA friendly than the book and I can totally see why. I'm reading it now and still love the movie version. Warm Bodies looks like fun! I love romance and zombies, so this is a no brainer for me. John Malkovich kicks but. He really does. Glad to hear you enjoyed this one! It really is such a sweet and endearing movie! It'll be one of the ones I recommend to just about anyone, for sure. I think I'm in love with Nicholas Hoult now.